You can create links using the icons on the right hand side of the editor, but occasionally you may have reason to insert links in another way. If you do so you will need to ensure that they are tracked so that the reporting in the results of the campaign are accurate. You will have three tracking options, as well as the default 'Track' icon. 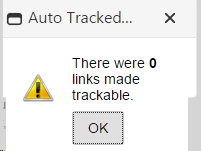 The number of links made trackable only includes the number of links that were not already being tracked. So you may have 10 links in your email but it will only show 1 tracked link. This 1 tracked link is a link which was not being tracked, then made tracked by auto-tracking.